The 'Model Grand Opening' weekend at Fountaingrove Lodge was a tremendous success. This is one major step - truly history in the making - of the first retirement community with a continuum of care developed specifically for the Gay & Lesbian community. 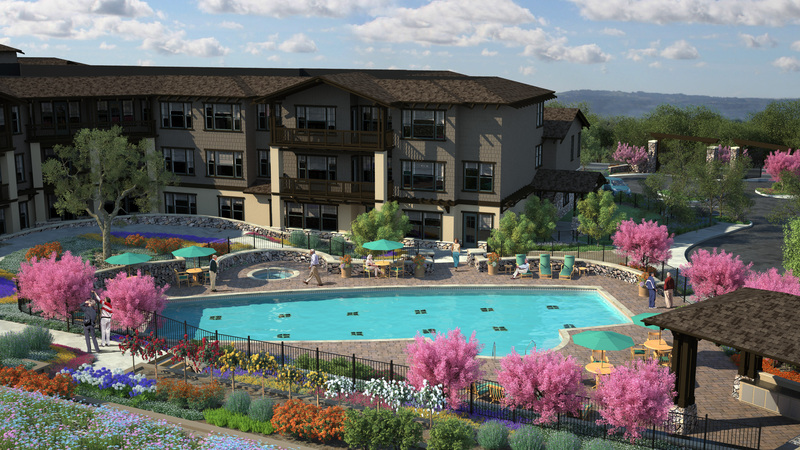 Fountaingrove Lodge, the nation’s first retirement community with the option of continuing care for the lesbian, gay, bisexual, and transgendered (LGBT) community, is in high demand with approximately 50% of units already reserved. Fountaingrove Lodge is located on ten acres in Sonoma County in the heart of California’s Wine Country, and observed its Model Grand Opening on June 18-19 with a well-attended Open House and ribbon-cutting and a first look of the model home. The community is set to open its doors in late 2012 or early 2013. More than 400 people attended the Model Grand Opening weekend festivities at Fountaingrove to get a look at the bungalow model home on the site. The event garnered significant media attention, with guests and dignitaries admiring the high-quality workmanship and exquisite design of the model home. A proclamation from California State Senator Mark Leno added to the prestige of Thursday afternoon’s ribbon-cutting and VIP preview celebration. Fountaingrove Lodge will be comprised of six bungalows and 64 well-appointed apartment homes in nine different floor plans – ranging from 830 to 2,001 square feet – designed in the Craftsman style of architecture, with the use of fine woodwork and stone inside and out that echo the native rocks and trees on the site. The property will boast a library, business center, bank, salon and day spa, great hall for special events and dancing, library, gift shop, pet park, and bocce court, with wireless service in the main common areas. Residents can join friends for a glass of wine in the lounge, grab a snack in the bistro, or enjoy meals in the formal dining room. They can also throw a private party in the Wine Cave, rustle up a game of cards, watch a favorite film in the HD theatre, or get creative in the art studio. Fountaingrove Lodge is also adjacent to the spectacular championship Fountaingrove Golf Course. The inclusive community will feature an on-site fitness center with a fully equipped weight room and an outdoor pool. In addition, gourmet meals, weekly housekeeping, concierge services, and home and yard maintenance will also be available. Fountaingrove Lodge will also be a Continuing Care Retirement Community (CCRC), providing peace of mind for a growing number of seniors who want to live independently now but would like to have health care service close at hand should the need arise. Health care services will be made available in the home, paid for on a fee-for-service basis as a resident may need it, and include state-of-the-art emergency call and response systems. In addition, there will be an onsite care center which will provide memory care for residents with Alzheimer's / dementia. Options such as temporary home health care, follow up care during recuperation from short-term illness or injury, and full time private care are available. The Fountaingrove Lodge Sales Office is located on-site at 4210 Thomas Lake Harris Drive in Santa Rosa, California. For more information about pricing, amenities, or to schedule a tour, call 707-576-1101 or go to http://www.fountaingrovelodge.com. Oakmont Senior Living is a recognized leader in the retirement industry, having planned and developed more than 30 retirement communities in the western United States. Oakmont’s policy is to solicit input from each and every employee and to foster an atmosphere of mutual respect and a free exchange of ideas, with the goal of remaining a vibrant and thriving company. Oakmont is dedicated to listening to, understanding, and responding to the needs of seniors, and ready to undertake the groundbreaking project that is Fountaingrove Lodge. Historic Ribbon Cutting at Fountaingrove Lodge 6-16-11Photo of VIPs and depositors at the Grand Opening Artist's rendering of pool area at Fountaingrove LodgeFountaingrove Lodge is currently under construction in Santa Rosa, California.